Hello there! It's been quiet around Scarlet Elfcup for some days now. But, don't mistake the silence for lack of activity. There is one little girl who has been on travel with me for the past week or so and she has been celebrating day after day. Here on an island she's been busy rock climbing, snorkeling, swimming in the ocean, laying in the sun, hiking, attending many big family gatherings in preparation for a big family wedding. And now, she awaits the finale...a July 4th weekend celebration for the United States and a July 1st weekend celebration for Canada Day! The name Liberty was chosen for this little girl because she represents just that...a doll created in honor and in celebration of Independence Day (July 4) and Canada Day (July 1). 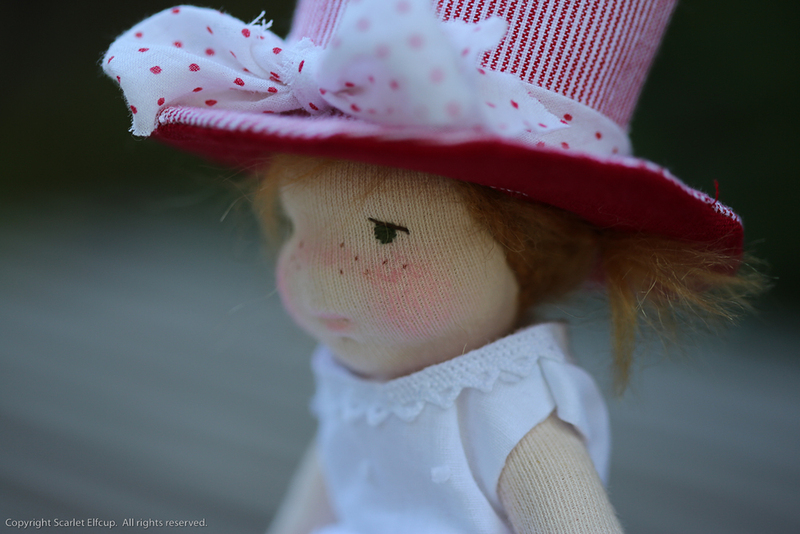 Liberty is Scarlet Elfcup's very first jointed doll. She is a Le Petite Elfcup doll. She stands less than 8" (20 cm) tall. She is made with all natural materials. 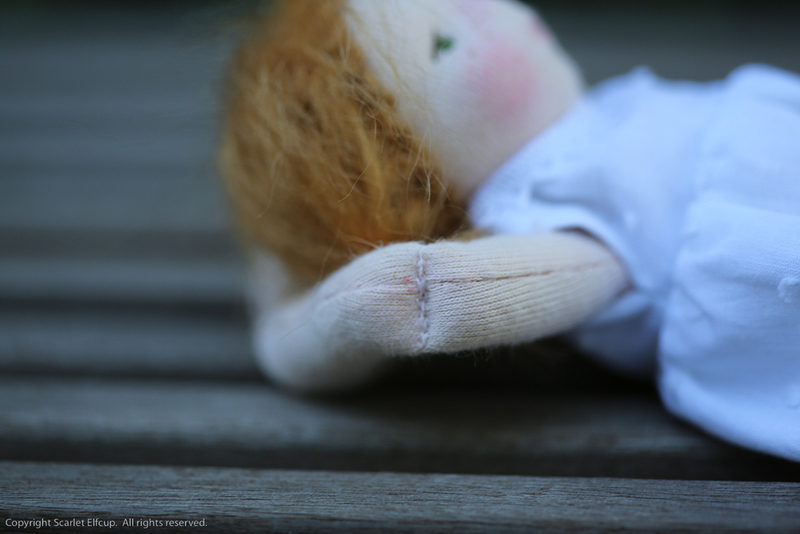 Her doll skin is made with premium quality cotton interlock made in the USA. She is firmly stuffed with bio-wool also made in the USA. Her seams are sewn twice for reinforcement. She has embroidered facial features. Her facial structure is sculpted giving her a sweet little face with an itty-bitty chin, round chubby cheeks, and deeper set eyes. 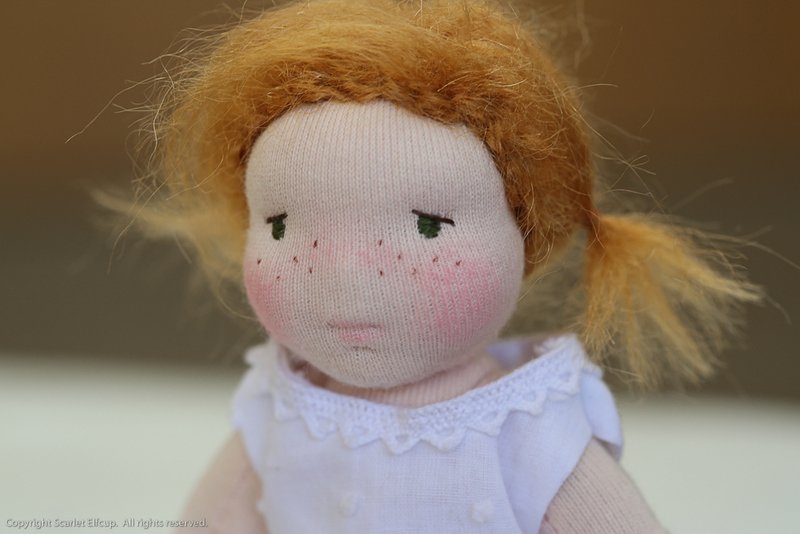 Her cheeks are decorated with tiny freckles and blushed with red beeswax. Her nose and various body parts are also blushed with red beeswax. Liberty's hair is made of mohair yarn and tied into two sweet pigtails. She is a sitting jointed doll. Her knees, legs and elbows are sewn joints and her shoulders are string jointed. She also has a belly button and a bum. Liberty's jointed knees, legs, elbows and shoulders allow her to be very playful. She can be set and posed in a number of ways that are not possible with an unjointed doll. The imagination is left up to you. Be precautioned that although her shoulders are string jointed, they are not to be bent beyond 90 degrees or twisted and turned beyond a 90 degree angle for this will put stress and strain on the string and it will eventually break. She, like us, does not like to withstand the pain of having her shoulders bent beyond a reasonable point. So, withhold from rough play with little Liberty. Liberty comes wearing a white 100% cotton summer dress. Her dress is lined with a 100% cotton fabric and opens fully on the back with two nickel-plated snap buttons. Underneath she wears white cotton bloomers decorated with pink elastic lace. She brings along with her an extra change of clothes...a grey summer dress made of 100% cotton and Liberty of London fabric printed with Su Blackwell's floral art design. The dress is decorated with a hand knit capped sleeve made with 100% alpaca and a hemline adorned with soft grey tulle. The dress opens fully on the back with two nickel-plated snap buttons. Liberty's shoes are hand knit with 100% alpaca and embellished with two red buttons. Liberty also comes prepared with a button down, hand knit mustard cardigan made with a 75% merino wool/25% nylon blended yarn. To top it all off (no pun intended), Liberty comes wearing a celebratory top hat made of the colors red and white to represent colors present in both the Canadian and the American flag and to honor the celebration of freedom for both countries. 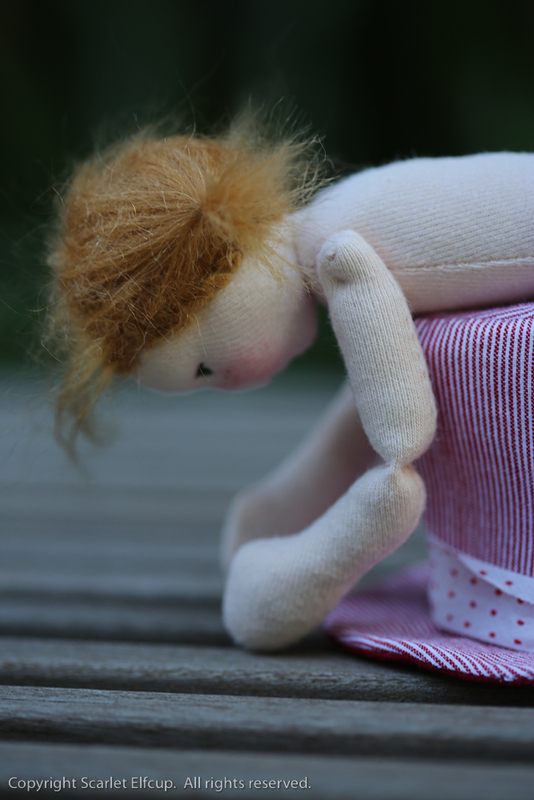 Her top hat is made of 100% cotton and linen and lined with a firm stabilizer. Liberty is recommended for ages 8+ due to the nature of her delicate design (her shoulder joints are string jointed and very moveable, but they will not withstand rough play) and the many buttons and fasteners on her clothing that pose as choking hazards for young children. Liberty will be available for 24 hours via The Northern Collective upload in Hyena Cart on Tuesday, July 7, 2015 at 2100 hours (9:00 PM EST). This is a good opportunity to bring Liberty home for a discounted price. If she is still available after July 7, she will be placed in Scarlet Elfcup's Etsy shop at retail value....a good opportunity for those who are interested but don't have an account with Hyena Cart. The Northern Collective is a Canadian handmade market place specializing in a diverse array of goods including dolls, clothing, hand spun yarn, knitted and crocheted goods, stuffed toys, felted arts and crafts and quilted items. Please visit The Northern Collective's blog and Facebook page to learn more about them and to preview the upcoming July 7th collection of beautiful hand made items by this talented group of makers. I would like to send many thanks to Jaime Lynda and everyone at The Northern Collective for inviting Scarlet Elfcup to join as a guest in this week's grand celebration of Independence Day and Canada Day. I am deeply grateful for this opportunity to be a part of such a talented and fun group. I can't wait to see all the beautiful hand made items that will be available on July 7th.